How does a man get elected President after serving less than one full term as a U.S. Senator? Does being a community activist/antagonist qualify one for the highest office in the land? Were the Soviet defectors correct in that Obama is the manifestation of a multi-generational plot to bring America to her knees? It is easy to comprehend how and why Putin would want to destroy America. But is Obama is his accomplice in this mission which could imperil all of us? Did you really think Alger Hiss would be the last communist traitor to serve in a high level US governmental position? Through the testimony of high-ranking Soviet defectors, it can clearly be established that the Russians have been engaged in a multi-generational plot to destroy the United States from within and from without. Domestically, the Russian communists are in the midst of completing a coup d’état, with the help their communist stooge, Barack Obama. In the following paragraphs, the verbatim statements of high ranking Soviet defectors are offered as proof of these claims. The first three defectors tell how the Soviets are setting the table for America’s demise. Stunningly, the fourth defector warns our country of a Manchurian candidate type of leadership whose job it will be to hand over a weakened America to the Russians (see Part Two). Today, many people have been in a position to now vet the President after Obama’s first six years in office and observed his “fundamental transformation of America“. This particular series will continue to connect the dots of the secretive and nefarious communist background of Barack Hussein Obama. With the general warning by Russian defectors that a traitor was waiting in the wings, it is time to reveal the true nature of the Manchurian candidate who sits in the Oval office through a brief examination of his family members with CIA affiliations along with their exposure to the MKULTRA mind control experiments being conducted at the University of Hawaii. With the stroke of his executive order pen, President Obama quickly moved to seal off his records from public view after his election. However, he was too late to completely hide his background as researchers, such as Wayne Madsen, have found significant information to demonstrate that what Obama has omitted, is that his rare rise to power can only be explained by his family’s CIA roots. The election of Barack Hussein Obama is the culmination of what the Soviet defectors have been warning America about for decades in that Obama’s ascendency to the Presidency was part of a documented long-term strategic plan to recruit selected candidates into intelligence, while guiding these individuals and their families into high-ranking intelligence community positions before executing the meteoric rise to power by one of their own. For example, George H. W. Bush was a former CIA director, and CIA member going back to the 1950’s and thanks to Wayne Madsen, we now know that Obama’s family was CIA and not just CIA, but a CIA mind controlled family. Obama is the Soviet messiah as he will eventually become known as the Second Coming of Stalin. He has been prophesied by Soviet defectors Lunev, Golitsyn, Suvorov and Bezmenov, and now he is here to fulfill his mission. Question: What do Barack Obama and the “Unabomber” Ted Kaczynski have in common? Answer: Both Kaczynski and Obama had significant exposure to the MK-ULTRA experiments; Kaczynski at Harvard and Obama at the University of Hawaii and the Ford Foundation much earlier. Outrageous? Madsen painstakingly and conclusively demonstrated that virtually all of Obama’s relatives were CIA operatives. Madsen has found even more CIA connections to Obama’s first employer. Madsen further went on to describe how Obama’s family was clearly exposed and was intimately connected to MK-ULTRA’s mind control program at the University of Hawaii. Info Wars also carried Madsen’s expose and it is available here. President Obama’s family and former Ex-Goldman Sachs executive, Ex-Treasury Secretary and World Bank leader,Tim Geithner and his family have been joined together at the hip for decades. Tim Geithner’s father worked for the CIA in the Rockefeller funded Ford Foundation in Asia. Geitner’s father was in charge of micro-finance for the Ford Foundation for all of Asia. From Wayne Madsen’s work, we know that President Obama’s mother was in charge of micro-finance in Indonesia. The Hollywood producers could not make this plot up. Geithner’s father was Obama’s mother’s boss. It is likely that Geithner’s father tagged Obama as a potential presidential, CIA, Ford Foundation, well–groomed Manchurian candidate. 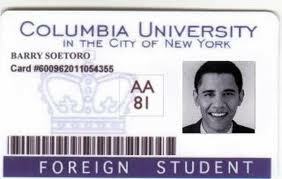 Additional information comes from the discovery that the two universities that Obama attended, Harvard and Columbia, were prime CIA recruiting grounds. The Ford and Rockefeller Foundations continued to fund Columbia’s Soviet studies programs through the early 1980s, where Obama was a student. And would anyone care to guess what Obama was studying? Obama was enrolled in a Soviet studies program taught by Zbigniew Brzezinski. And to those who are new to NWO conspiracies, one might wonder who is Brzezinski? Brzezinski was the former National Security Adviser under President Carter. But more importantly, he was also the co-founder of one of the most influential globalist organizations in all of history, the Trilateral Commission. If you know your New World Order history, you have chills going up and down your spine as you read these words. We should be mindful that Brzezinski, in his book, Between Two Ages: America’s Role in the Technetronic Era (1970), that he laid out the NWO conspiracy to control all nation states and usher in a totalitarian world government. Comrade Obama’s ascension to the presidency has been a long time in the making. Interestingly, Barack Obama’s past associates especially the communist terrorists which funded his Harvard legal education and ultimately launched his political career as an Illinois state senator, namely, Bill Ayers and Bernadine Dohrn, have been in lockstep with Obama his entire adult life. However, Dohrn and Ayers were not the first to indoctrinate Obama with the Marxist communist philosophy. For that information, we have to begin with Frank Marshall Davis. Obama’s real father, Frank Marshall Davis, was a member of the Communist Party and a former Soviet Agent who was under FBI investigation for a total of 19 years. In 1948, Davis moved from Chicago to Hawaii leaving behind a colleague named Vernon Jarrett, father-in-law of Senior White House adviser, Valerie Jarrett. Yes, the Jarrett’s are communists as well. Both Jarrett and Davis wrote for a left wing newspaper called the Chicago Defender in which they espoused a communist takeover of the United States Government. In 1971, Davis, according to Joel Gilbert, reunited with his then nine-year-old son, Barack Obama, and schooled him in the ways of being a good communist for the next nine years. Adding more fuel to this communist fire, it is interesting to note that both Senior White House Advisers, David Axelrod and Valerie Jarrett were both also “Red Diaper Babies, in which they were the sons and daughters of well-to-do parents who desired communism and lived out their dreams through their children’s revolutionary activities. Other notable red-diaper babies also include such notables as Rahm Emanuel and Eric Holder. Jarrett’s situation is particularly interesting in that her family and the Ayers family have been multi-generational friends which also included a marriage between the two families. Much of the Obama administration is a nest of well-established communists and this should serve to gravely concern every American citizen. Following the nine years of mentoring and parenting by Frank Davis, Obama made some very important communist connections which ultimately led to him obtaining an impressive college education financed by some very familiar communist activists, namely, Bill Ayers and Bernardine Dohrn. You remember Bill and Bernardine, don’t you? The Prairie Fire book was co-authored by Dohrn and Ayers, and, quite unbelievably, it was dedicated to Sirhan Sirhan, Robert Kennedy’s assassin. A former FBI informant, while appearing on The Common Sense Show, Larry Grathwohl, revealed that he testified in a court of law that Ayers and Dohrn had direct involvement in a terrorist plot which killed San Francisco police sergeant, Brian V. McDonnell, by a bomb made and planted by these Weathermen Underground terrorists. How are Bernadine Dohrn and husband Bill Ayers not in prison? The only logical explanation is that Ayers and Dohrn are and were CIA assets whose mission consisted of guiding the young communist, Barack Obama, and his legal education and later, launching his political career. If Dohrn was not a CIA asset, then how can anyone explain how she teaches at a prominent university with her felony background, conviction and the time she briefly served in prison? Grathwohl also revealed on The Common Sense Show that he asked Ayers, in a meeting of about 25 well-to do Weatherman, most with advanced degrees from Ivy League Universities, what the Weathermen planned to do when they achieved their goal of a communist take over the government. Grathwohl stated that Ayers paused for a moment and then said that it was likely that about 50 million Americans will have to be re-educated in concentration camps located in the American Southwest and that about 25 million would have to be eliminated, meaning that they would have to be murdered. Bill and Bernardine’s Weather Underground had the support of Cuba, East German intelligence and the North Vietnamese. 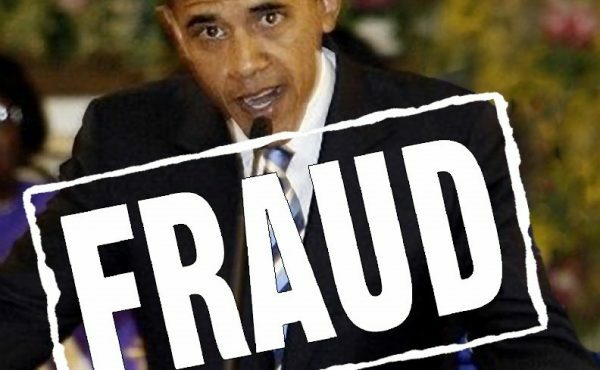 I believe that Obama could end up being the fulfillment of the Ayers “re-education prediction, and with the power granted to Obama by the NDAA, that he will fulfill Ayers’ promise to Grathwohl to murder 25 million Americans who cannot be “re-educated”. During the Vietnam war era, Ayers championed black civil rights and he and Dohrn further chastised white society for their treatment of blacks. Grathwohl also revealed that Ayers wanted to support the beginning of a race war by killing whites, from supposed black villains, and then blaming whites in order to begin a race war. How eerily similar does this sound to the Charles Manson Family and their Helter Skelter plans to execute that very same objective? While Grathwohl was infiltrating the Weathermen, Ayers ordered FBI infiltrator, Grathwohl, to blow up a Detroit police substation to which Grathwohl said that a nearby restaurant, where many blacks ate would suffer many casualties. Ayers replied that some have to die for a revolution to proceed. Ayers and Dohrn raised a foster son, Chesa Boudin, who worked for the late Hugo Chavez, communist dictator in charge of Venezuela. Chesa Boudin was the child of Kathy Boudin and David Gilbert, members of a Weather Underground spin-off group who went to prison for an armored car robbery that resulted in the murders of two police officers and a security guard. Dohrn served seven months for her role in the robbery and this is the reason that she is ineligible to become bar certified as an attorney. Is anyone else uncomfortable with the fact that Ayers and Dohrn were the ones primarily responsible for educating Obama with the communist funds and then subsequently launched his political career from their living room? Well, it is true, please read on. “I am going to become the President”. Readers should take note that this is an affidavit, and as such, is formally considered to be evidence, not conjecture or hearsay. There can be no other conclusion that the communist terrorist, Bill Ayers, and his father, the former head of Con Edison, Tom Ayers, began grooming Obama to become America’s first communist President. 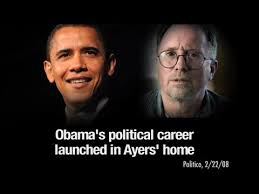 Bill Ayers and President Obama’s relationship continues into the present time as it is on record that Ayers visited the White House in August of 2009. I think it is likely that the Weatherman Underground was a CIA created false flag operation simply designed to assist the communist inspired group with the ability to undermine the country and that Obama represents the Weatherman’s finest achievement. The Weathermen were nothing more than mere Soviet collaborators that Soviet defectors had previously us warned about. We also know that Obama’s communist affiliations continued well into his adulthood because of the good work of Joel Gilbert who discovered that Obama was active with a Weathermen Underground support group known as The May 19th Communist Organization, in New York. Perhaps, this is why Ayers was visiting the White House in 2009. Frank Chapman, a communist activist and a member of the communist front group known as the World Peace Council. Chapman clearly used the term “mole” to describe Obama. He said Obama’s political climb and subsequent success in the 2008 Democratic presidential primaries was “a dialectical leap ushering in a qualitatively new era of struggle.” Chapman further stated that, “Marx once compared revolutionary struggle with the work of the mole, who sometimes burrows so far beneath the ground that he leaves no trace of his movement on the surface. This is the old revolutionary ‘mole,’ not only showing his traces on the surface but also breaking through. 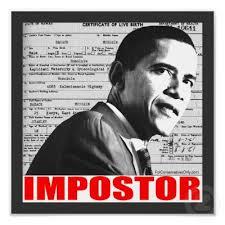 The Communist Party USA backs Obama to the hilt.” It is clear that Obama is their man! Because of the psychological principal, cognitive dissonance, no amount of direct or circumstantial proof would convince some people that the highest political position in the country has been compromised by a communist plot spanning several decades. The term cognitive dissonance refers to a person who received information so shocking, so upsetting, that they cannot adequately process that information and then instead deny the validity of the proof that anyone else could see. If you are one of the cognitive dissonance types, please allow me to ask you a few questions. 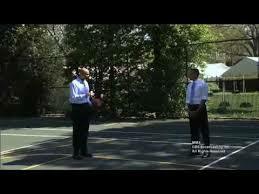 Who was Obama’s basketball coach in high school? The President has some degree of basketball skills as he defeated former NBA player and sports broadcaster, Clark Kellogg, in a game of pig (how appropriate) in front of a national TV audience. Who was Obama’s history teacher in high school? Why don’t we see interviews with his former professors, teachers, coaches, childhood friends and his first girl friend? Who in the hell is he? There are no visible answers to these questions are there? But still the cognitive dissonance crowd still persists with their abject denials. To them, I say let’s judge a man by his actions, not his words. Have Obama’s actions served to help or hurt America? Do his Presidential actions match up with his communist background? It is an easy, perhaps, groundless accusation that Obama is truly the manifestation of what Soviet defectors warned us about when they stated that America’s leadership would become compromised and lead America down the path of destruction. Ask yourself America, how could we collectively allow a person with Obama’s very limited political background into the White House? More importantly, how could Obama’s questionable background escape public scrutiny? And the most important question lies in understanding the the answer to this question, “Can anyone clearly demonstrate his intention to bring America down by his own actions?” The answer to this question is unquestionably YES, and this will be covered in Part Four of this series! When we put Obama’s misdeeds side-by-side, it will become easy to see how Obama is deliberately trying to dismantle America prior to entering martial law followed by World War III.